#15-090 - Incredible value at an incredible price. 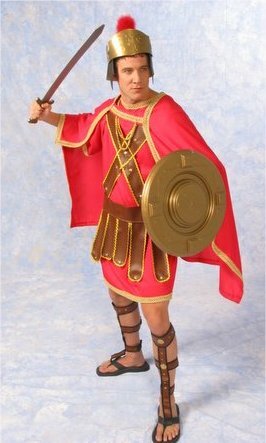 Our Economy Trojan Warrior includes a poly-cotton roman style undertunic in red with gold braid trim and matching cape with metal chain closures. Matching simulated leather armor in brown is also heavily trimmed in gold braid and features metal stud accents. Sword, shield, and helmet accessories are sold separately. All of our costumes are made from durable, theatrical-quality fabrics for repeated use. Standard adult size fits most. This item is currently discontinued.